Andrew Scott reprises his role in a revival of the acclaimed Paines Plough production of Simon Stephens’ Sea Wall at the Old Vic, playing as part of the theatre’s 200th anniversary celebrations. First staged at the Bush Theatre in 2018, the play went on to be performed as the NT Shed in 2013 and later the Project Arts Centre, Dublin, in 2015. A striking one-man play about family, fear and unchangeable acts, Sea Wall follows Alex, who has a good life with his wife, daughter and job. Speaking about visiting his father in the South of France, as well as tangents about religion and beliefs, the play explores how everything dependable can easily be taken away. Despite happiness, the weight of life can sometimes take its toll. Multi-award-winning actor Andrew Scott stars in the play, which was originally written for him. Scott recently appeared as the titular role in the Almeida Theatre’s critically-acclaimed Hamlet, with further credits including The Dazzle, Birdland and Design for Living. He is best-known for his screen roles in Sherlock and Spectre. Directed by George Perrin, who is the joint Artistic Director of Paines Plough, Sea Wall was created for Scott by Simon Stephens, whose credits include the smash-hit stage adaptation of The Curious Incident of the Dog in the Night-Time, as well as Birdland, Punk Rock and Heisenberg: The Uncertainty Principle. 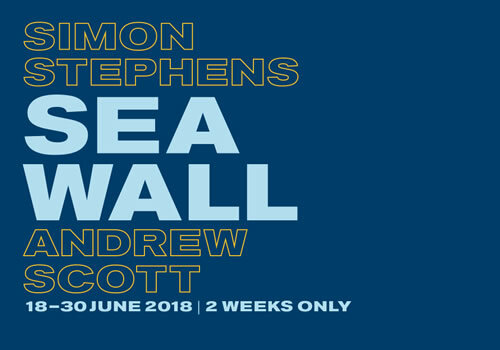 A stunning piece of writing that brings to light pertinent issues of everyday life, Sea Wall plays at London’s Old Vic for a strictly limited two-week season, from June 18th to June 30th 2018. Sea Wall is suitable for those aged 14 and up.